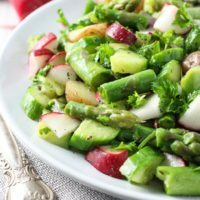 This potato salad with avocado is made with small baby potatoes, radishes, snow peas, cherry tomatoes, and avocado. 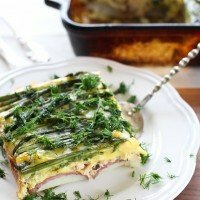 It’s super creamy and very filling. I wish I could start this post with a pretty picture of spring flowers and a short story about how much we are enjoying the spring weather. I mean, yes, it feels like spring when the sun manages to peek through the clouds and it’s light outside up until 8 pm. But we still haven’t put away our winter clothing and the most of us haven’t been brave enough to change winter tires. 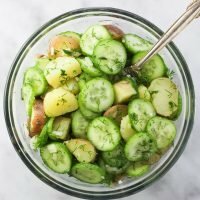 To make it a little bit more spring-like here on the blog, I decided to share with you this Potato Salad with Avocado recipe. The pictures turned out so light and fresh with so many shades of green and I thought they are a perfect reminder that the warm days are near. If you are eating low GI, you are probably careful about potatoes. It’s true that baked and mashed potatoes are very high GI. Small baby potatoes, on the other hand, are medium GI and can be enjoyed as a side dish or in a salad. 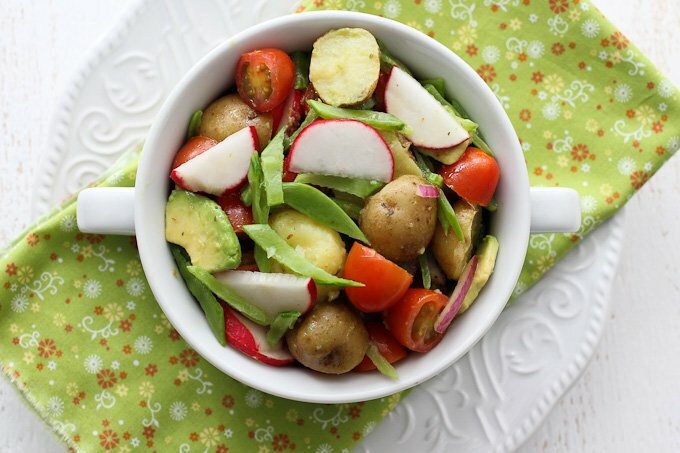 This Potato Salad with Avocado is a great alternative to the traditional potato salad. 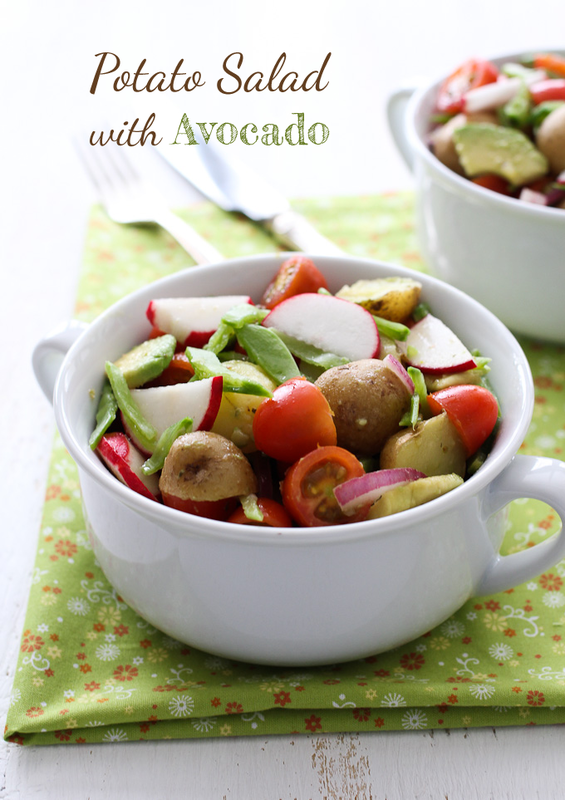 It’s made with crunchy radishes and creamy avocado. 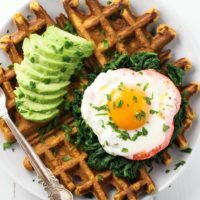 Super yummy and healthy! Rinse the baby potatoes under cool running water. If needed, brush them with a vegetable brush to remove excess dirt. Place the potatoes in a medium saucepan and add cold water just enough to cover. Over medium-high heat, bring the potatoes to a boil and cook uncovered until the potatoes can be easily pierced with a fork for about 10 to 13 minutes. Carefully drain the potatoes and let them cool. 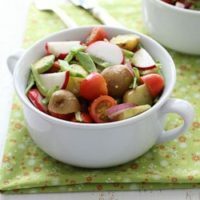 Once the potatoes are cool, slice each potato in half and place into a large salad bowl. Add the onion, snow peas, radishes and cherry tomatoes. Pour the lemon juice over avocado slices making sure the slices are evenly covered with the juice. Add the avocado slices to the rest of the vegetables. See the Notes. 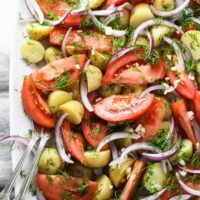 To make the dressing, mix the olive oil, vinegar, salt and dried oregano in a small bowl and pour over the vegetables. Carefully mix to combine. 1. Because avocado oxidizes quite quickly it might turn unpleasant dark color if you keep this salad in the fridge overnight. 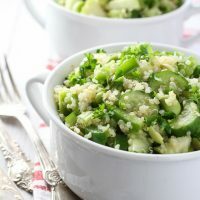 If you want to prepare this salad in advance, do not add the avocado and dressing to the rest of the veggies and keep them separately in the fridge until you are ready to serve. Maria, this looks so delicious that it’s going to be featured today at the Retro Re-Pin Party. Come by to grab a featured button and see it there. Thanks! What a gorgeous salad! I love avocado and it looks great in this salad. I’ve pinned it to the Retro Re-pin Party Board. 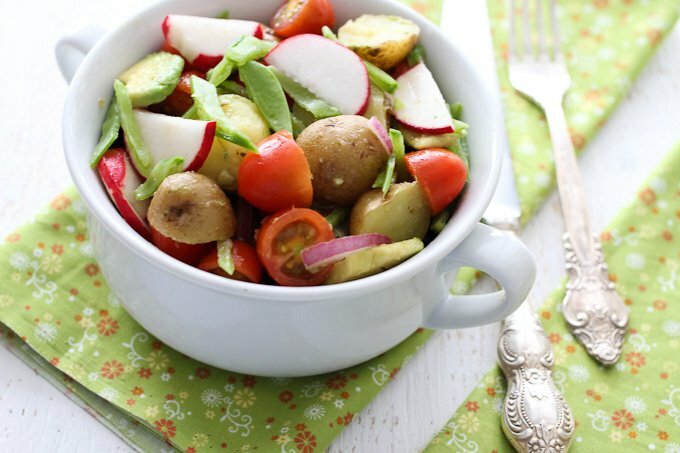 What a beautiful and springy looking salad! I love using baby potatoes in a salad, and never knew they were lower GI. I’m also jealous that it’s light outside by you until 8:00! Yes, small baby potatoes have a medium Glycemic Index of 62 and the Glycemic Load of 13. Not bad. It’s light but it’s pretty much it! Today is so cold, I can’t believe it!